Abu Simbel is famous for its four imposing statues of the seated Pharaoh Rameses. Those sculptures guard his temple's entrance. They and the temple behind them were originally carved out of the same sandstone cliff, over three millennia ago. Pharaoh Rameses II wanted to impress his Egyptian subjects of his grandeur -- and to set fear in the hearts of his formidable Nubian enemies who threatened Egypt's southern border. Each of the seated Abu Simbel statues is as high as a five-story building. For scale, notice the statues standing between the pharaoh's legs -- they are life size. The construction of Egypt's vast Aswan High Dam across the Nile River in the 1960s posed a problem. It would have submerged Abu Simbel and therefore lost to future scholars and tourists. Abu Simbel was moved to higher ground. 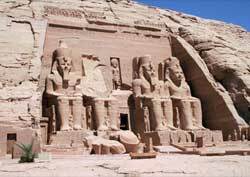 This required cutting Abu Simbel into large blocks and reassembling them on top of the cliff, safely above the rising waters. This remarkable engineering feat was accomplished by a joint Egyptian and international effort, finishing in the nick of time. The nearby temple of the wife of Rameses is also a part of the Abu Simbel complex. That temple is an archaeological must-visit.